At least 12 civilians have been killed in a rocket attack in Donetsk, RIA Novosti reported, citing Donetsk People’s Republic officials. Ukraine’s military has blamed the separatists for the attack, calling it an attempt to undermine Minsk peace talks. The Dontest People's Republic Defense Ministry claims the attack was carried out from nearby residential area which is according to them "a neutral zone located to the north of Donetsk Airport." The spokesman says "the Ukrainian forces approach, attack and then step back to their positions." 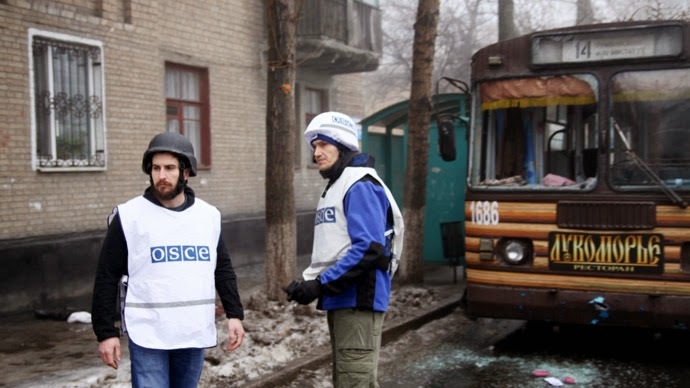 The humanitarian headquarters has stopped aid distribution across Donetsk in order to keep locals and volunteers safe. On January 24, a residential area in the port city of Mariupol came under fire, killing 30 people and injuring 100. On January 22, 15 people were killed when shells hit a trolleybus stop in Donetsk. On Friday, talks between the contact group’s members on the Ukrainian conflict should have taken place in Minsk, but were canceled due to the absence of the Kiev representative, Lugansk and Donetsk representatives told RIA Novosti. "Unfortunately, the Ukrainian side didn't join. Ukraine is still avoiding dialogue," Lugansk's Vladislav Deinego said. The Minsk peace accord on September 5 was signed by representatives of Russia and Ukraine, as well as Lugansk and Donetsk representatives. The deal was aiming to stop the military conflict in the Donbass region. Since September, all sides have repeatedly accused each other of ceasefire violations.